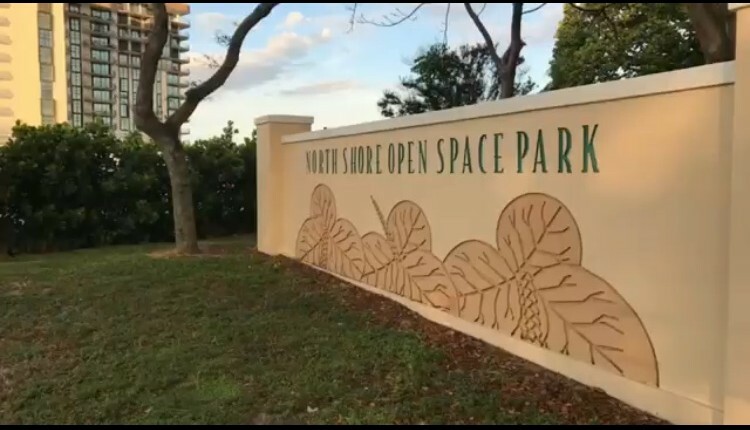 After concerns were raised following confusion over the redevelopment plans for North Shore Open Space Park, the City is being careful to bring the community into the discussion over proposed changes. At a public meeting this week, designer Gianno Feoli joined the City’s Capital Improvement Projects staff in unveiling a plan for more resilient dunes and landscaping, continuous walkways, and upgraded picnic areas, playground, dog park, restrooms, and security. Countering earlier rumors that the park’s footprint would be reduced, Feoli emphasized the current park is 27.89 acres and would remain 27.89 acres. After those assurances, discussion turned to the landscaping changes in the park. Feoli emphasized the plan would add more than 34,000 sf of conservation areas, spreading out the current clusters of sea grapes which are now concentrated to the north and pruning them to increase opportunities for visibility and open views to the ocean. Feoli indicated the landscaping in the park now is not as diverse as it needs to be for conservation areas because the sea grapes are so dense they are crowding out diversity. In addition to pruning, plans call for additional plant species to be added to these conservation pockets extending from north to south. The discussion continued at today’s Neighborhood and Community Affairs Committee meeting. More details were provided on tree canopy and anticipated removals: There are over 3,300 trees in the park now and, in the end, there will be 265 more trees on site. The difference, according to Feoli, is that some smaller non-native trees that provide little shade will be removed and replaced with larger growth, native, and more resilient trees. Trees to be removed include those that have “structural damage”, invasive species, or those competing with others in the conservation areas. The Committee decided to bring the proposal back at its meeting next month to hear an update on the concerns raised with regard to the trees as well as answers to questions regarding fencing, beachwalk material, and playground design. Commissioner Michael Grieco also suggested another community outreach meeting prior to going before the Design Review Board in March. “We want as much input as possible,” he said. morales says online petition contains "misinformation"
Join us with this Email already exists!